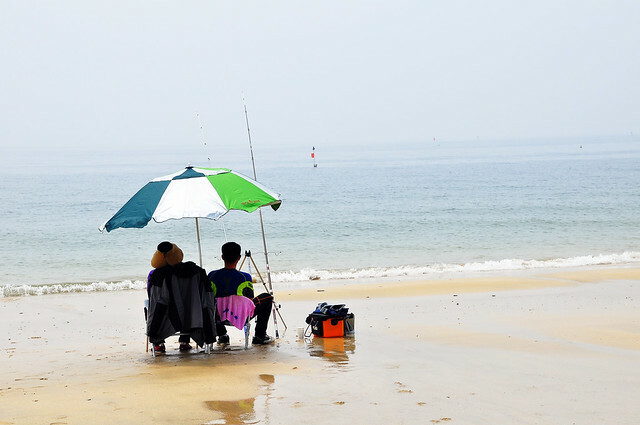 You are here Home » Daecheon Beach — White Sand Beach on the ROK! 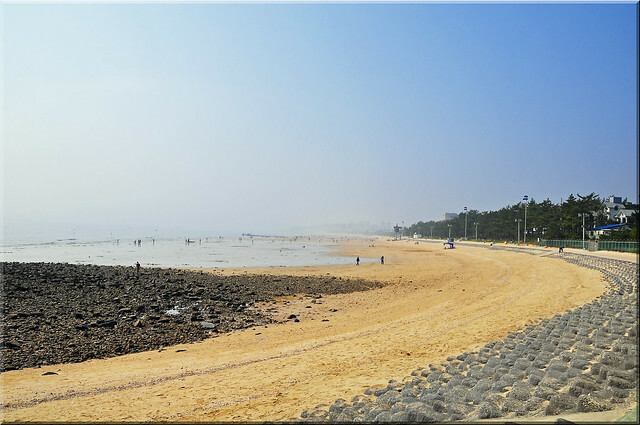 Daecheon Beach — White Sand Beach on the ROK! Welcome to another week of Travel Photo Thursday. This is the second year that I’ve celebrated my birthday at Daecheon Beach; a stretch of white sand 1.5 hours outside of Daejeon. The day was hazy, so not the best for photos. However, we had a lovely time walking the beach. Here are a couple of shots from the day. AND….Don’t forget to check out Travel Bloggers Weekly Photo Choice. Discover how you can have your photo and blog featured on Budget Travelers Sandbox. PS…this is our last day in the apartment. Indy and I will be camping out in our new digs tomorrow night, and the movers arrive around 1pm on Friday. We are going from the ground floor with no sun, to the top floor; no bars on the windows and loads of sun. I wonder if Indy will get used to sunning herself on the window ledge! I can’t wait to have my first roof top barbecue! Getting there from Daejeon is easy…1.5 hours by bus to Boryeong, and then 20 minutes on a local bus shuttle to the beach. More info. on Daecheon Beach (famous for its annual July mud festival). Admission to the beach is FREE! Even with the haze, it still looks like a great way to spend a special day. I like how those rocks seemed to be arranged on the seashore. Hope you had a wonderful birthday! Have fun in your new home. All good wishes to you Nancie. And I love those beach scenes. Life is a beach, isn’t it? What an unusual and appealing beach! Looks like a happy place to spend a birthday. Happy late! Great looking beach – I love the fishermen sitting on their beach chairs under the beach umbrella – great image! Good luck with your move! Were those rocks carefully arranged? Love the long coastline. I can totally imagine myself running here! Happy birthday Nancie. What a lovely way to spend the day – and it doesn’t look the least bit busy. Do they actually catch any fish (what fish?) on that beach? Admission to the beach is free? Shouldn’t it be as a matter of course in Korea? I saw one guy catch a small one…brown and kind of flat..no idea what it was. An hour and a half to get to the beach? That’s crazy, but I guess it’s worth it if it’s how you want to spend your birthday. It looks nice anyways. New apartment and a birthday at the beach, what more could a girl ask for, eh? Happy Birthday, Nancie! Can’t believe they’re really trying to fish on that beautiful beach. I guess those fish come really close to shore. I don’t think beaches when I think of S. Korea, but this looks beautiful. Wish I had made it there when I lived there. Best of luck with the move. This reminds me of one of the beaches that we visited on Easter Island….very peaceful getaway after a few days of fast paced tours. Mud festival? I’m keeping my fingers crossed for pictures! Oh, and Happy Birthday! Ah, I could use some beach right now. Love the last picture. I can hear the waves rolling in. Wishing you a beach-ful year. Happy birthday and good luck with the move! Reminds me of the beaches on Okinawa. Beach days are my favorite days. Great shots and they make me want to escape to the beach now! There’s something about a hazy day at the beach that I absolutely love. Your Gone Fish’n pic really tells a story. So, is this where I tell you Happy Birthday late??? :)) Hope it was a great one!